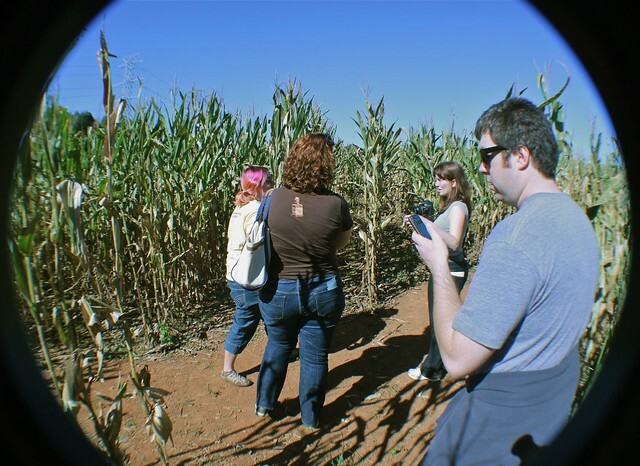 Home / Events / Corn Maze Adventure 2010! This year’s Corn Maze Adventure came courtesy of Mckee’s Farm, in Rougement, NC, about forty minutes away from us. In addition to a few farm animals and Mapleview Farm ice cream, they’ve got the largest maze we’ve tried yet: 12 acres! Before we headed in, we spent some time taking pictures of the farm animals, which included a donkey, a couple of goats, a rabbit, and some roosters. Also, they had the rare and dangerous wild corn cob. And of course, I made Ben pose inside the tractor cut-out. A Jack O’Hay Bale losing his straw. So sad. This friendly scarecrow pointed us in the right direction, lest we got lost—and more embarrassed— in the children’s maze instead. We broke into groups by whoever happened to be closest together and headed off in separate directions, and on a leisurely pace for our group of Ben, Brian, Dawn, Erika, and myself. Dawn is pretending that her cell phone cut out for the camera here, as being in a cornfield demands it. And here she is, being stalked by my hands! About this time, ten minutes into the maze, Melissa B. and Laura P. accidentally found their way out already! They decided to shoot the breeze and eat ice cream rather than continue trudging through the maze—they were smart! A little ways farther in, Ben and Erika decided they would try polar opposite tracking techniques. Ben used an app on his phone to track where we’d gone, which worked okay until his GPS failed. 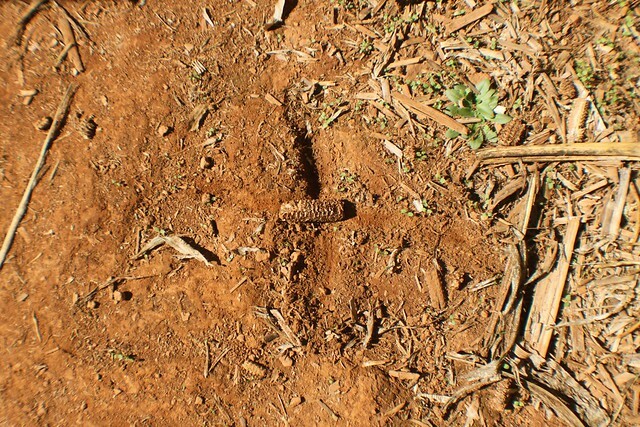 Erika used a system of corncobs, arrows in the dirt, and chapstick that made a lot of sense to her, but I couldn’t make heads, tails, or cobs of it. Corn stalk growing skyward . . . like they always do. I’m so profound. After an hour and a half or so, Dawn, Brian, and Erika threw in the towel with only half our stations found. Ben and I continued on stalwartly, occasionally glimpsing Laura C., Jordan, and Melissa C. through the corn field haze—or were they mirages? Another half an hour later and only one more station down, Ben and I admitted defeat also. Only about ten minutes later, the final three emerged victorious! Okay, they really just looked tired, but I was happy someone made it through. In the end, I think we learned that 12 acres was too much maze for us! I’ll try to be less industrious picking a spot next year so I won’t feel like such a corn-maze loser. The group, minus Melissa B. who had a date with a farmer’s market, relaxed in the shade with more ice cream before ending our adventure. I also picked up an $8 pumpkin from the farm’s selection and promptly carved him into a charming, happy, cyclops jack o’lantern. Any afternoon that ends with a face like that is a good afternoon, even with failing at the corn maze. For more pictures, head to our photo website or Brian’s fabulous shots at his flickr site . 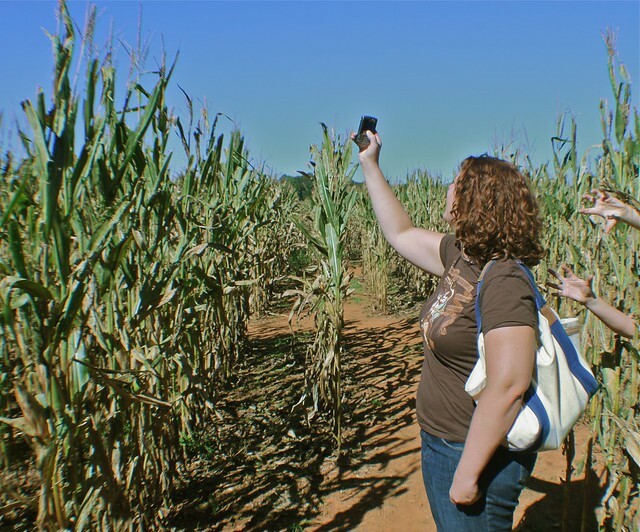 4 thoughts on : Corn Maze Adventure 2010! Thanks, Rocio,and sorry I’m late responding. It was definitely fun, but I think I might like Ken’s Corny Maze in Garner the best of the relatively nearby mazes. I noticed you said I was “smart” to just chill out. that makes me feel better… I thought I was exceptionally lazy! Granted, I didn’t INTEND to only spend 10 minutes in the maze, but it was a lovely day for eating ice cream and watching small children throw up on the swings. I have to call you smart in comparison to the two hours I spent without success. My head still hangs low with failure.